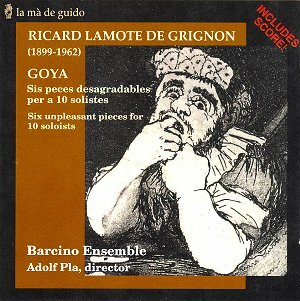 Ricard Lamote de Grignon y Ribas, to give him his full name, was a Catalan musician who lived through the most difficult period of recent Spanish history, namely the fascist rule of Franco. His father, Joan, in whose footsteps Ricard followed, is in fact the more famous musician of the two. Like many artists, Ricard suffered terribly at the hands of Franco � living and working in Barcelona, he had been �purged�, imprisoned and his life threatened by the regime. The main work on this CD, Goya, is a product of his experiences of this time. The sub-title � Six Unpleasant Pieces - is, of course, engagingly ironic, and reflects a Catalan preoccupation with the relationship between beauty and ugliness in artistic work, something that can be seen strikingly, for example, in the work of the architect Antonio Gaudi, which nobody who has visited Barcelona can either fail to notice or ever forget. The Peces Desagradables are scored for an ensemble of ten instruments which are either bass instruments or ones capable of dark tone � clarinet, bass clarinet, bassoon, �cello, double bass, two pianos, timpani and two percussion � and are a wonderfully apt musical counterpoint to the strange Goya etchings which inspired them (and which are helpfully reproduced in the booklet). It goes without saying is that they are not �unpleasant� at all; many of the textures are strangely beautiful, and make their impact with gentle, understated colours such as high bassoon or soft percussion. I was often reminded of the Alban Berg of the Three Orchestral Pieces, especially as the musical language is, like Berg, broadly atonal yet with occasional hints of tonality. The fourth movement, Bellos consejos �Good Advice - appears to refer to the famous Sailor�s Hornpipe � pa-pa pom pom pom � but I think this is just fortuitous, unless of course the two women in the related Goya etching are discussing the merits of English seamen. Doubt it. The piece is played with restraint and imagination by the Barcino Ensemble under director Adolf Pla. The other pieces � for double-bass, �cello and flute, are much more conventional, and presumably written for members of the Barcelona Municipal Orchestra, where de Grignon was assistant musical director for some years. These are attractive but unremarkable music, and the only drawback is the noisy sniffing of �cellist Josep Pazos. Why do �cellists sniff such a lot more than other string players? Answers on a post-card please. An unusual and highly enjoyable disc, this. Goya is really worth hearing, and my only quibble is the short measure � 42 minutes is pretty miserable value.